We are living at a time on Earth when we have severely overpopulated the planet, where our technology has outpaced our spirituality, and where we have polluted our rivers, soil, oceans, and air -- as well as our minds and bodies. All of us are being called by the Light to wake up and take responsibility for ourselves and our spiritual growth. We are being called to come together and heal ourselves and others in magnificent acts of love, both large and small. Irrespective of the relative magnitude of each individual action we take, they sum to a mighty force of Love that creates change beyond our ability to comprehend. filled with Divine Light, Love and Laughter. be returned to you a thousandfold. This means that Source will not interfere in our lives unless we ask. That is a very important detail to remember. We must ask for help. Sometimes we need to be very persistent in asking because we have been reluctant in other times to ask and to receive assistance from the Divine. In a manner of speaking, we will be 'tested' to see if we really mean it. At other times, we are gifted with the Grace of what we are asking for in a blinding moment of Light and Love. When that happens, it is because we are 100% congruent in both asking and receiving. I was working with a client some months ago who was experiencing intermittent weakness in her muscles. She asked in her regular monthly session if we could look at that to see if there was an energetic contributing cause. When I checked her level of congruence she was at 100%. I asked Source for the entry point. Source responded, "Bleedthrough from an alternate reality in which she has the equivalent of muscular dystrophy." I asked the underlying cause. Source responded, "Trauma. Lots of trauma which resulted in a significant stress overload that compromised her physical health in that reality." Source further said that in this lifetime in this reality, my clielnt's muscles were not absorbing energy from food in order to get her attention so she would ask for this work to be done. As we progressed deeper into the work, it became apparent that she with a team comprised of the Archangel Gabriel, the Archangel Michael and Christ would need to go back with my client to an earlier time in that reality to help that aspect of her understand the implications of her choices and actions before she made them and they manifested in physical illness. This would enable her to make other choices if she wished to do so. When the team went back, they found that aspect of my client was not congruent with doing what she needed to do to prevent the manifestation of the consequences of her choices. We worked with her to bring her to 100% congruence and she shifted immediately. My client experienced a tremendous release at the moment the other aspect of her shifted. Since then she has not had any problems with her muscles feeling weak or shaky. Source said that the aspect of my client who was in another reality reached across time and space in the only way she knew for help to my client in this reality. As I have said before, we are so much more than we know ourselves to be. We have been deceived by appearances. Wake up to Divine Reality. Today I asked for a miracle. OK, there is more to the story as usual. My sisters future in-laws visited the local church here in San Jose Del Cabo, Mexico. They came back talking about Saint Charbel, the Saint of Miracles. There is an altar honoring him there. The legend is that you write your request for a miracle on a colored ribbon and hang it on the statue of him or his altar. Once your miracle is granted, you return with a white ribbon with a thank you for the miracle. All of us decided to ask for a miracle. We each took a colored ribbon, mine was red, and wrote our request on it. Together all five of us went to the local church to visit his altar. He was covered in colored ribbons and a good amount of white ones. His right hand had no ribbons on it so my sister, her fianc, his father and mother hung their ribbons from that hand. I had hung mine on the altar. Alan (the fiance) asked if I would hang mine with theirs and he would tie them all together as a family. It was very touching. We each prayed quietly asking for our individual miracles, though in that moment, I felt we had been granted one, family. We all plan to return here to hang our white ribbons once the miracles happen. Which I am sure will be soon. I did some research on this saint. It is a very interesting story. He was a hermit monk that was very religious and had extraordinary abilities when he was alive. He was clairvoyant, could help heal people and more. It seems that when he died, they buried the body in dirt, no coffin. For 45 days an bright light came from the grave and people came to get healings. After a few months the authorities dug up the body and found it floating in mud looking as if it had just been buried. The body was still flexible and a blood like substance dripped onto the sheet. This substance has been used to heal many over the years. His grave has been dug up a few times and each time, it looks as if he was just buried and still the blood like substance flows from the body. There are many stories about the healing people have gotten over the centuries. Many cultures have different ways of asking for miracles. It so happens this Saint is honored worldwide. The story fascinated me and made me think. Do I take the time to ask for miracles? What exactly do I believe is a miracle? I took it seriously as I wrote on my ribbon today and as it was hung on his right hand. Just this brought the 5 of us together. I just met my sister's fianc and his parents this week. Yet today, we became family. That I believe is a beautiful miracle. I will keep my eyes open for the ones I requested today. Yet, I know there are miracles around me every day if I just looked for them and noticed them. Do you ask for miracles? around you on a regular basis? 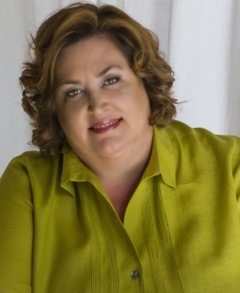 Michelle DeBerge is a professionally trained divorce coach with over ten years experience. She is the founder of Starting Over Without Him. She graduated from The Coaches Training Institute in San Rafael, California and has studied with several of the leading workshop facilitators in the United States. Michelle is currently Level 3 in the Dancing With Source™ work. Michelle has been recognized both locally and nationally for her work. Through her own exploration and reflection as she went through divorce, she developed many techniques that she incorporates in her private practice.